Ah Loy Thai is hardly a new name for local foodies given its reputation for serving up decent Thai food at very affordable prices. While we have grown accustomed to paying the extra 7% GST and 10% service charge to our food bills, it is always a delight that we made some savings on a meal as these were not levied. We are not experts when it comes to eating Thai food and quite frankly, taste is just so subjective validating the phrase one man's meat is another man's poison. There are way too many elements in a meal that can either complement or upset your perception of a good dish and meal. Be it customer service or ambience, quality of food is never the only judging criteria - to us anyway. Pardon the digress, so back to Thai food. 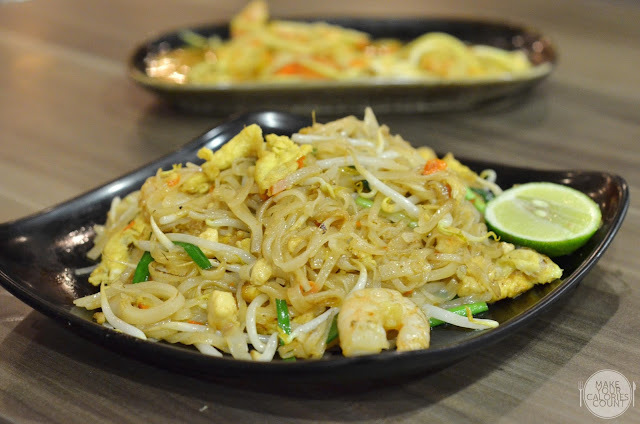 Our recent favourite is Nakhon Kitchen which in our opinion would be a place that we would not mind returning, given the price point and quality of food we get though I can never forget my experience as a food nazi on our last visit. 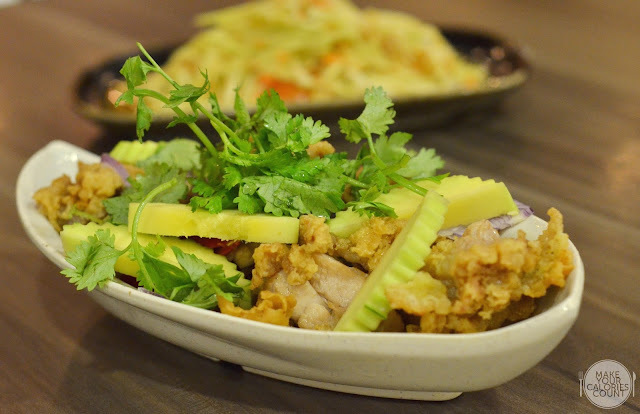 Revisiting Ah Loy Thai would put Nakhon Kitchen to a challenge given their close offering and competitive prices - whatever it is, let us start eating already! Comparing this to our first visit back in 2012, prices have increased slightly from S$7.50 for the dish though this is acceptable given inflation. Portion size was certainly generous for what we paid for but presentation was rather clumsy. The narrowly-shaped plate struggled to hold the chunks of crispy deep-fried chicken together alongside the thickly-cut mango. While we enjoyed the mildly spicy and tangy dressing, it was hardly enough to coat the chicken. It was also obvious that the chicken was placed onto a prepared plate as the dressing was at the base. This made it difficult to taste the key element, which controls the various dimensions in flavours. Texture wise, we enjoyed the crispy batter but the flesh of the chicken underneath was slightly too stiff, reflecting a lack of dedication to the cooking time. 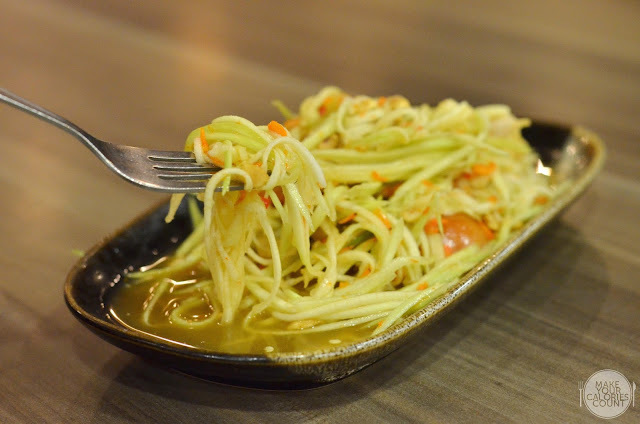 When it comes to appetisers for a Thai meal, it seems customary to initiate with a classic spicy mango or papaya salad. We went for the former and while we enjoyed the firm texture of the consistently sliced mango, the dish sorely lacked a balance in flavours. It was way too acidic for my palate and tolerance as I cringed upon the first mouthful. The heat from the salad was almost targeting our tastebuds in silos and soon enough, I found myself breaking into perspiration. Not sure if this was a one-off disappointment to their signature dish but this definitely does not justify our calories. The fact that we deserted the dish after the second mouthful was a clear testament. 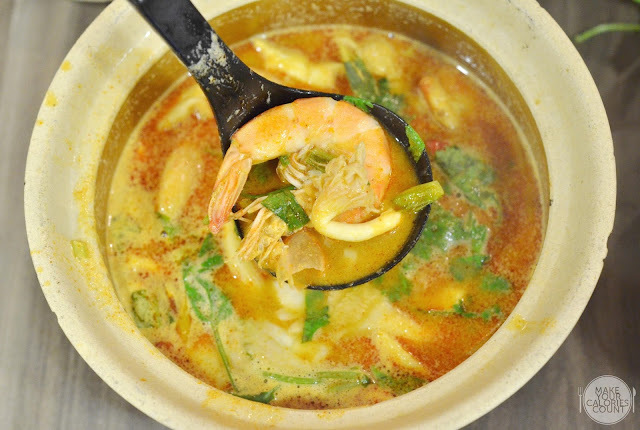 As we became increasingly dismayed by the dishes, the signature tom yum seafood saved the day, almost. The flavours were a clear kaleidoscope to what tom yum broth should be, a beautiful balance between the heat level and acidity. We also enjoyed the clear broth which allowed the natural flavours of some ingredients such as lemongrass and kaffir lime leaves to enhance its fragrance. For the price, there was quite a generous portion of calamari and prawns in the broth, definitely enough to share among two people. 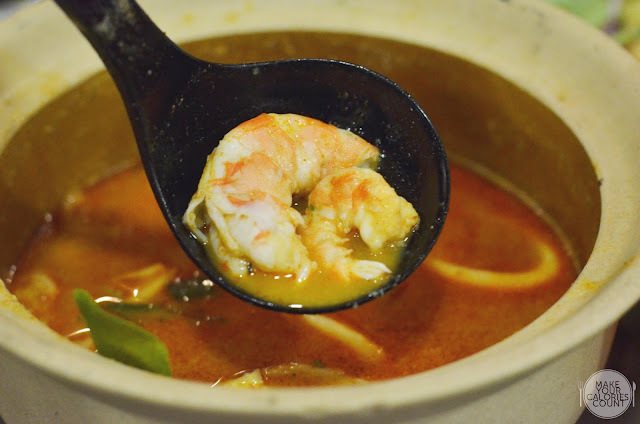 While I also enjoyed the fact that the seafood did not overcook in the broth, the only upset was the disparity spotted in the sizes of prawn served. If you are particular about having your prawns deveined, pass it to your other half to do it - well he should be deshelling it for you anyway. The stir-fried flat rice noodle dish was executed well that bore the right amount of wok hei which was imparted to the al dente flat rice noodles. The crispness that remained in the bean sprouts also added another dimension with a nice crunch, topping off the variation in textures. It was not stir-fried with the most dedication though with disproportionately uneven sizes of the egg tossed on the plate. In terms of flavours, the expected kick from the tamarind flavours was lacking though the acidity and freshness to the dish was compensated by the wedge of fresh Thai lime. When it comes to ordering of food, each table comes with an order chit where you get to tick off your choices. Once done, help yourself to the cashier and payment is upfront. As mentioned earlier, the prices are nett of GST and service charge so for the price conscious, this is a plus. We liked the simple decoration with the bright lights and spacious seating arrangement which made Ah Loy Thai a decent place to hang out with friends over a Thai meal. Have the Thai Milk Red Tea (S$2.40/-) or the Kamquat (S$2.40), which is similar to your lime juice, to beat the spicy dishes. In terms of customer service, I thought it improved from our last visit and while there is no service charge, dishes are brought to your table so do remember to indicate your table number on your order chit. It was thoughtfully done for us by the server who brought us to our table. Our only complaint was that there was a trolley going around collecting the dishes and cleaning the tables. He was doing it at such frequency that it became somewhat disturbing to my meal. Overall, I felt that there are some hits and misses at Ah Loy Thai but even for those that ticked, they were not the best in town. Not sure if it was a case where we visited during the odd hours of 3pm for lunch that standards were not tip-top but that should not be happening in any case. Would easily prefer Nakhon Kitchen over Ah Loy Thai but the air-conditioning at the latter is surely a useful draw to the crowd! 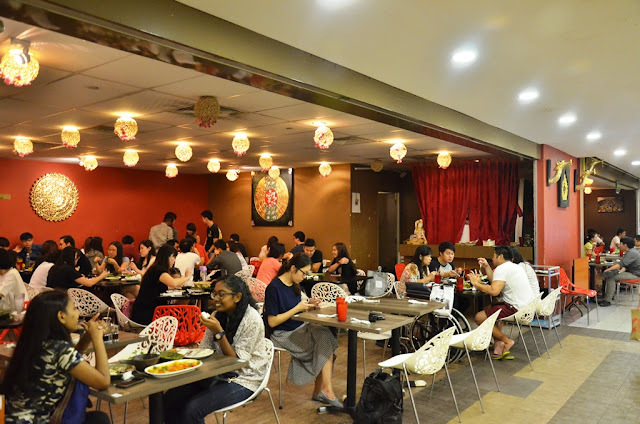 Do note that they close early, 8.15pm on weeknights for last order and 7.15pm on Saturdays. Closed on Sundays.